19 people met at the Smith's parking lot for this hike! 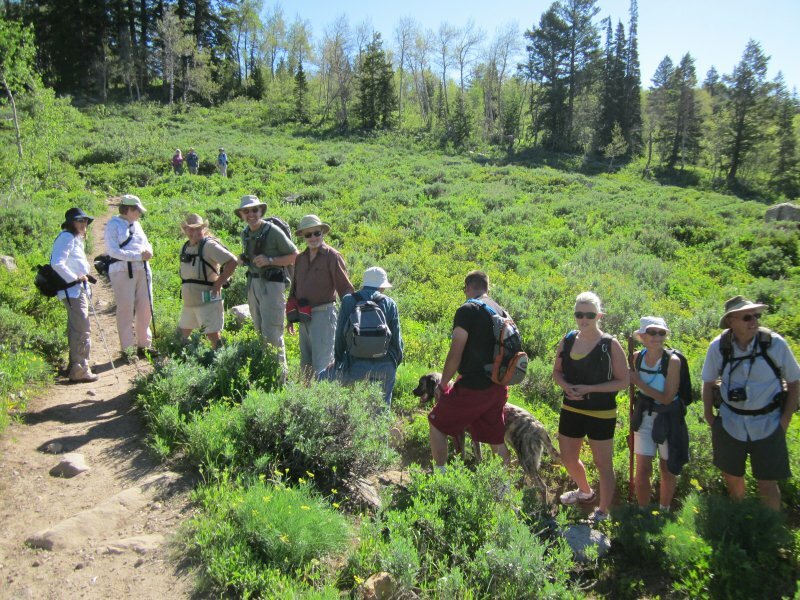 Gary, Roddy, Tim, Jeanne, Diane, Ann, Jane, Dave W., Dinah, Chris and Jen (and their dog) hiked in one large group all the way to White Pine Lake. Ed went back after 2 1/2 miles to take photos and to wait at Tony Grove. 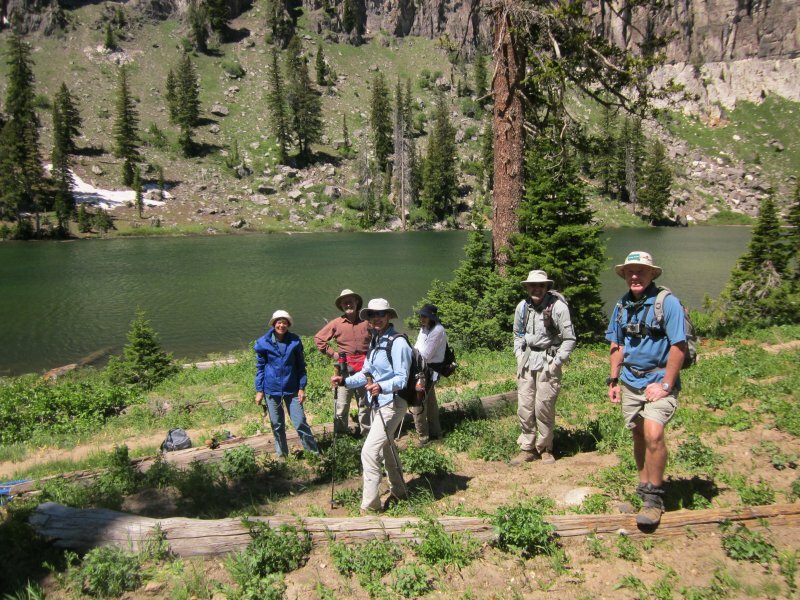 Dave E., Dan, Reinhard, Crystal and Sierra hiked as a slower-paced separate group, but they went all the way to the lake. Barbara and Patty came along to enjoy the Tony Grove, but they did not participate in the hike. This was a great day for hiking! It was hot in Logan, but the moderate breeze made for comfortable hiking weather in the mountains. 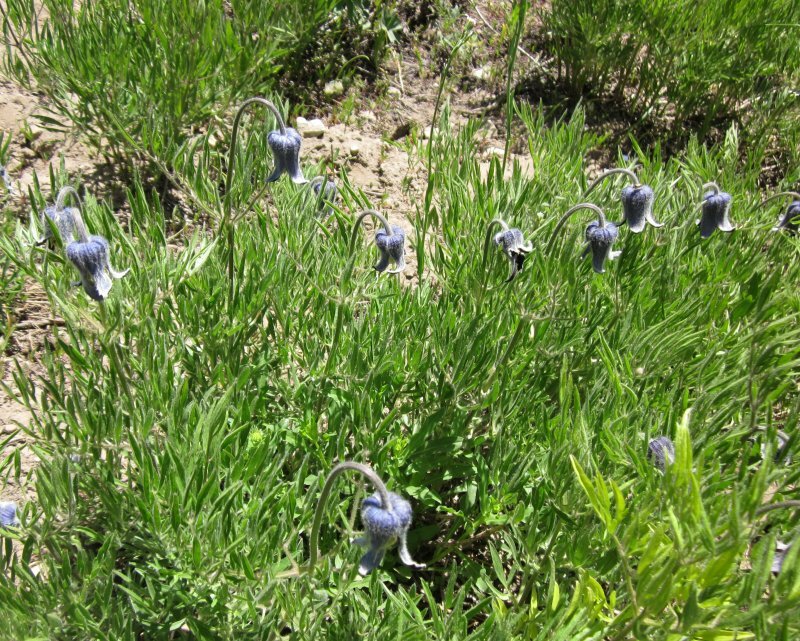 We saw many wildflowers, including the unusual Clematis hirsutissima (hairy clematis, or sugarbowls) in the meadow about 1/2 mile from the trailhead. There still were a few snow banks with nearby spring beauty and glacier lily flowers as we descended the north-facing slope to White Pine Lake. We enjoyed lunch with a view along the side of the Lake. On the way back we took the pleasant side trip to the Naomi Peak Trail, where several hikers chose to walk down to the Tony Grove Nature Trail, past the Giant Staircase, as they returned to the trailhead. The trail was in good condition, but there were a few problems. Trail users have created parallel paths over much of the first 2/3 mile. As we approached White Pine Lake we encountered switchbacks that have been short-cut, more parallel paths, broken signs, damaged handrails on the bridge and water on the trail. The Tony Grove parking lot was almost full when we got back in spite of the $5 fee (an attendant was stationed there to make sure everyone paid for parking). Total distance for this hike was about 7.5 miles round-trip and 1200 feet elevation gain. Total trip duration for the larger group of hikers, including the drive from parking lot to trailhead and back, was about 7 hours (8:00 to 3:00). The slower-paced group returned to Logan about 6:00.